Today, digital is a reality and providing the right ‘digital experience’ for different user segments is an imperative. ‘FANG’ companies – Facebook, Amazon, Netflix and Google have mastered the game of delivering the right ‘digital experience’. Banks who want to improve their ‘digital experience’ strategy can learn few tricks from FANG companies. We discuss more on this in our first article ‘‘FANG’ification of Banking’. Next, we look at digital financial services from the social lens and explore how mobile money is helping to bridge the gender gap in financial access in the article ‘Closing the Gender Gap’. We also explore the role of digital payments in strengthening fight against disease outbreak in the article ‘Tackling Health Crisis with Digital Payments’. Lastly, we go to Indonesia to find how digital payments are progressing in the world’s largest island nation in the article ‘The Indonesian Digital Payments Story’. Today, digital is a reality and providing the right ‘digital experience’ for different user segments is an imperative. ‘FANG’ companies - Facebook, Amazon, Netflix and Google have mastered the game of delivering the right ‘digital experience’. Banks who want to improve their ‘digital experience’ strategy can learn few tricks from FANG companies. We discuss more on this in our first article ‘‘FANG’ification of Banking’. Next, we look at digital financial services from the social lens and explore how mobile money is helping to bridge the gender gap in financial access in the article ‘Closing the Gender Gap’. We also explore the role of digital payments in strengthening fight against disease outbreak in the article ‘Tackling Health Crisis with Digital Payments’. Lastly, we go to Indonesia to find how digital payments are progressing in the world’s largest island nation in the article ‘The Indonesian Digital Payments Story’. With more and more payment transactions going digital, 2018 promises to be another crucial year for growth of digital payments. We take a closer look at the growth drivers of digital payments in 2018 in the first article “What to Expect in Digital Payments in 2018” In the second article “The Rise of China’s Cashless Society” we turn the spotlight on China and explore how it is becoming the global flag bearer for digital payments economy. Next, in the article “Mobile Money Interoperability” we discuss how service providers, regulators and industry bodies are working towards achieving interoperability to realize the true potential of mobile money. And, finally, in the article “Moving towards a Mobile Money Revolution in Afghanistan” we turn our attention to Afghanistan to look at how mobile money can help in rebuilding the economy of this war ravaged country. Mobile money has, to quote GSMA, “done more to extend the reach of financial services in the last decade than traditional brick and mortar banking has, in the last century. It has (and continues to) played a key role in deepening financial inclusion. So, what’s next?Herein lies the conundrum-the mobile payments space is, without a doubt, witnessing significant activity. However, not all trends are worth examining in detail. The second edition of Mahindra Comviva’s newsletter, featuring Gartner Research, aims to do just that. The newsletter takes an in-depth look at five trends that are shaping the mobile payments space-now and in the near future.Broadly, the newsletter takes a look at the evolution of mobile money services; the rise of enterprise mobile money; why conversational commerce is in the spotlight today; why unified payments acceptance for merchants ought to be the norm and the advent of digital banks. Digital Business continues to change and disrupt the telecom business. While this presents new monetization opportunities it has brings new challenges. High pressure on profit margins is leading to more digital disruption, operators are finding it harder to keep up with the distinct needs of next-generation consumers and support enterprise requirements for digital business transformation. 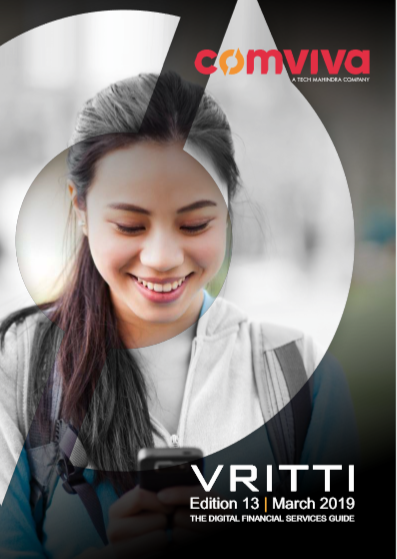 Vritti - The Digital Payments Guide, Edition 9. FinTech is not exclusive to startups anymore. Leading financial institutions are embracing technology to grow their business and expand their reach. This edition of Vritti explores how the disruptive nature of FinTech is revolutionizing financial services ranging from financial inclusion to wealth management. Happy 2016! Last year we continued to provide cutting edge product and solutions aimed at transforming the lives of our customers globally. Catch a glimpse of the same in the third edition of our Connections newsletter.